February will be here tomorrow so another month gone and a new one begins. Time sure flies by from time to time. December dragged on but January just flew by, I guess I was just so busy with different projects, that at times I didn't evern know what day it was. 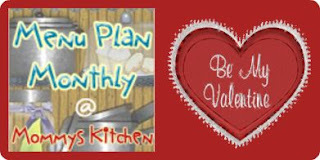 Today I am posting my February Dinner Menu for Menu Plan Monthly. Along with February comes Valentines Day, so lots of goodies to be made this month. I love the holidays because it gives me a chance to bake up some nice goodies for family, friends and my kiddos wonderful teachers. I love giving out little goodie bags to the teachers. It lets them know just how much we appreciate them. Plus my kiddos love helping me put them together so its a win win for everyone. For everyone who is familiar with Menu Plan Monthly then y'all know how it works. If you have a monthly menu plan I have included MckLinky at the end of this post. So you can link up your monthly menu plan it's as easy as that. If you have a two week menu plan you can still join in and link up. We can always use new meal ideas and inspiration. I will be jumping around and visiting everyones menus who link up, so thank you to everyone who joins in on Menu Plan Monthly. Click below to view my February Dinner Menu. I will also be contacting the three winners of the Free Dean's Dip Coupons via email so be on a look out, you might be a winner. I'm so impressed that you plan on a monthly basis! I can't seem to get past a week at a time :( Your menu sounds delicious! Hi! Just found your site, while over at Tried-And-True Cooking with Heidi. That's awesome that you plan for a whole month. I can barely get a week planned! I noticed your Chicken Fried Chicken recipe...it looks fantastic! Reminds me of the chicken and gravy my mom used to make when I was a kid, it was my absolute favorite. Can't wait to give it a try. Your cast iron skillet pizza sounds interesting too! Thanks! Hello! I'm stopping by from SITS and I sure wish I could stop over for dinner sometime... your meal plan looks fantastic!! I'm here via Amy's Finer Things. I don't menu plan monthly but I'm trying to change bad habits! Glad I found your blog. Am loving your site and am officially subscribed! Can't wait to browse more. Thanks for all the family friendly favorites. Another awesome monthly menu plan! Thanks for hosting! Can't wait to check out your links! Looks fabulous as usual Tina.